This game is perfect for horse lovers of all ages! The cards feature favorite horse breeds and there are 5 different games to play. For 2-4 players. Contents: 48 cards, game rules in English and French. Comments for Hooray for Horses! It's ok for young kids but no good for 13 up. It is all games you could play with regular cards but with horses. I love this game it helped me with all my horse breeds it took me a long time though. 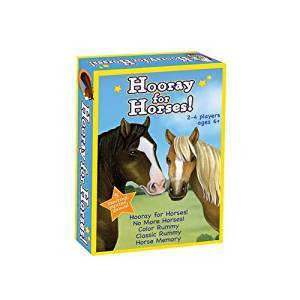 Return to Share Your Favorite Horse Board Games!.